1. Combine the ingredients numbered 1 in a small vessel. Cook for 3 – 5 minutes. Add the ground coconut mixture and crushed mustard seeds. Taste-check for salt. Cook for a couple of minutes at low heat. Switch off. Add yoghurt when it turns warm. 2. Heat 2 tsp coconut oil in a small pan. Splutter mustard seeds and fry dry red chilies and curry leaves. Pour over the prepared kichadi. Serve with rice and other side-dishes. 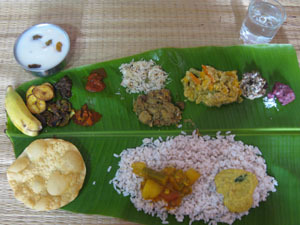 We had it with muthira thoran, pulisseri, meen vattichathu and kappa fry.